Installation view: Almanach 16, Le Consortium, Dijon, France, 2016Courtesy of Le Consortium, Dijon. Born in 1965 in Ontario, Canada, Angela Bulloch graduated in Fine Art from Goldsmiths College, the University of London in 1988. One of her light installations, which involved light bulbs switching on and off, was included in that year’s Freeze exhibition, organised by Damien Hirst, who was a student at the time. Eight years later, she was nominated for the Turner Prize. Her work spans multiple media forms and reflects the artist’s interest in rules, cybernetics, mathematics and technology. 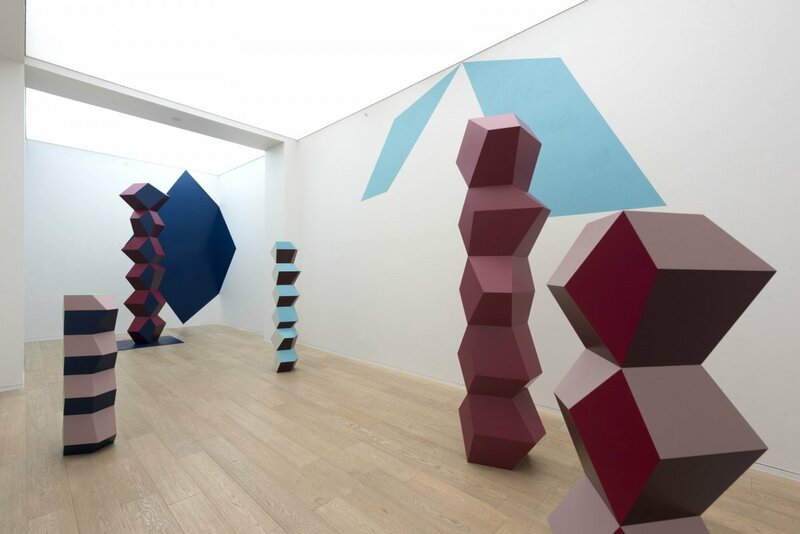 She exhibited her famous “pixel boxes” series at Simon Lee Gallery, which was her Hong Kong debut, and the second solo exhibition in October is showcasing a new series of sculptures. 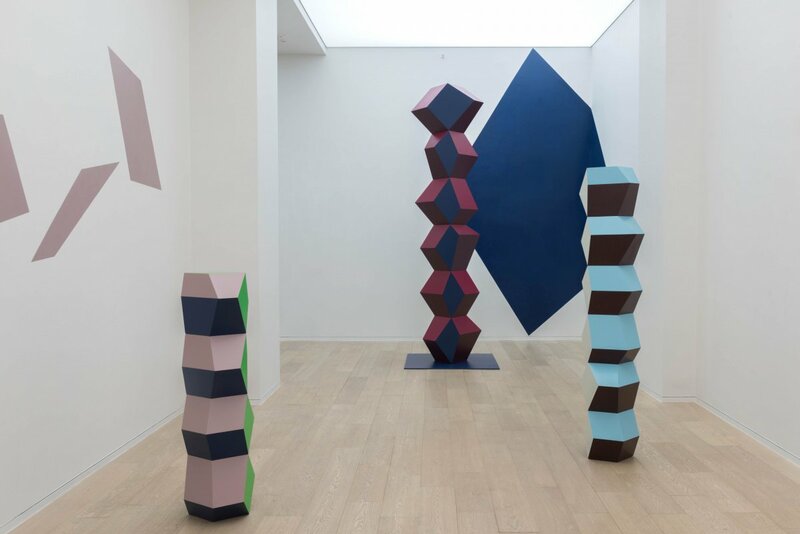 Set against a backdrop of paintings of irregular shapes on the wall, the geometrical and totemic columns of stacked polyhedrons are all covered in different colours, creating an illusion of dimension and space. I talked to the artist at the opening of the exhibition about both her practice and her life. Why is the exhibition titled “One Way Conversation…”? It’s from a song by New Order called “Sunrise”. It is quite a dark song, about a person becoming increasingly dissatisfied with their relationship. As the lyrical content gets darker and darker, the music gets lighter and lighter. So there is a kind heaviness in what the person is saying – as they voice all their dissatisfaction – but at the same time, you get the increasingly lighter and brighter elements of the music. So there’s a contradiction in the song. It’s an interesting dynamic to experience within the idea of a song; that sentiment is something which changes over time. I think it can also be very well applied to my exhibition. Are the paintings on the wall part of the work? Do they remain the same at every exhibition or are they site specific? They are specific for this site of the exhibition, but they also exist as wall paintings, in this form and colour, as well as in variable dimensions. I wanted to make something that corresponds directly to the sculpture, but in another form, that can be put on the wall and echoes the sculpture. They are literally from the forms of the sculpture. 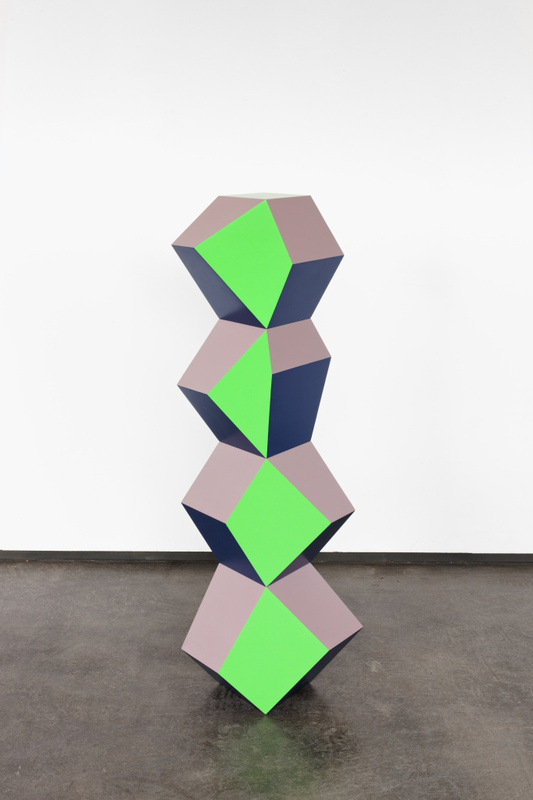 How did you calculate the angles and shapes of the sculpture? I have a computer for that. I don’t really mind, as long as it looks good and is balanced. I make a lot of aesthetic choices and the computer does the calculations. I’m not interested in that side of it. What software do you use then? Different software that has to be translated into complicated engineering software in order for the machines to cut the objects, except for the metal ones, which are cut by laser. Have you ever conceived a piece digitally, but not been able to realise it in real life? It’s very difficult to realise something insubstantial. Lots of things don’t work, so it’s a challenge to make something that actually does work, aesthetically. 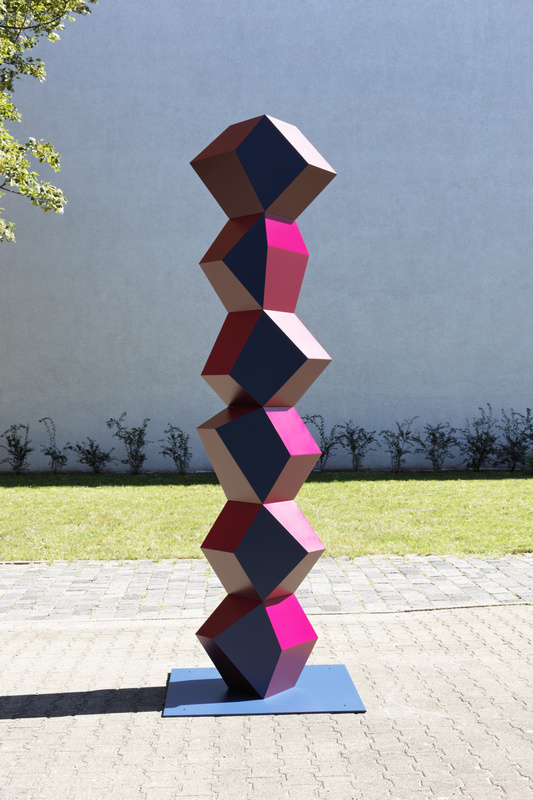 It has to be in balance and also function as a sculpture that can literally stand up. This is your second solo show in Hong Kong. Is there any work in the exhibition that was inspired by this city, and do you find cities inspiring in general? It could have been inspired by Hong Kong, but in this case it wasn’t. I have thought about topology before and used it for certain configuration of some exhibitions, but I didn’t for this exhibition. What do you think of the YBA (Young British Artists) label? (Laughing) Now that I’m fifty, I think YBA is a little bit flattering, or just wrong, or funny, or something, I don’t know. I don’t care about it now. When I was 22, it was important for me. It was helpful in terms of managing media responses to my work because whenever I mentioned this little label, everyone was like, “Oh yeah, YBA”. But they were just talking about a media generated label, instead of the actual work. It’s easier, isn’t it? It’s for lazy journalists. Going back to my previous question, how much are you involved in the technical aspect of the production? 100%. I mean, I have help in different directions in different things, but it’s my work. Factories make all the work, but that doesn’t mean it doesn’t belong to the artist. It’s very hands-on in an aesthetic way, in terms of the concept and its realisation, because a lot of things have to be checked at each stage of the process. It’s not easy to make them. I do all parts of the stage, but I’m not the factory. I’m not the one painting it. That is done with a big machine. Somebody then puts together all the parts by hand. You mentioned in previous interviews that interactivity is an important feature in your work. 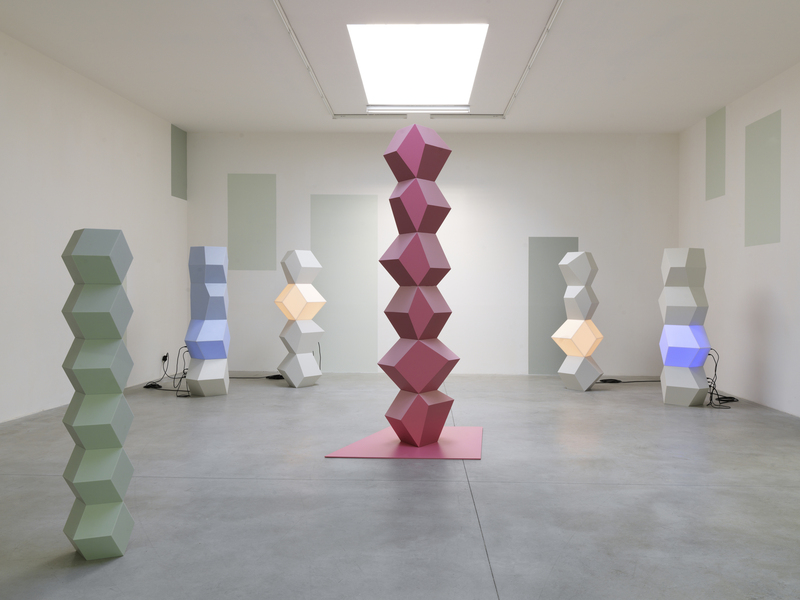 How do you expect the audience to interact with this series of sculptures? When people move around the sculptures and wall paintings, it’s a very direct and simple interaction. I’ve used more elaborate and deliberate ways of making artworks before in more interesting situations, both interactive and interpassive, which used the expectation of the viewer as part of the work. But here it’s much simpler. It is exactly what it is. It’s a question of perception, what changes when you move around the room, and what you think when you stand next to the objects. Can I say that your previous works were inviting? No, that’s too general. I’ve done artworks for 25 to 30 years now and it’s more complicated than that. Viewers’ expectations are an active part of the work, whether it’s interactive, interpassive or simpler than that. The context you place the sculpture in is very important in the way you see the work because of the surroundings. Another dimension I think of is the meaning of the context and the viewers’ expectations. What do you think of technology? I care about how people use technology and how it shapes people’s lives, and the relationship that exists between people via technology. This includes me because I use a computer all the time as an artist to make sculptures. This has become a rather over-important interface that exists between us and another reality; one that could become our world. Everything is technology. Ink on paper is technology. It’s something we have done all the time since we were cave people. So we have a long relationship with technology and it’s a normal, typical thing for us to do. You can avoid using a lot of technology, but there’ll always be certain places where the technology will use you. We all know how it affects all our lives, even if we want to stay completely away from it. The last question is about your love of music. How does it affect your visual art production? I have a record label and I play live music. I do many different things but I don’t see them in separate categories. Of course, they are not the same thing, but one crosses over into the other. I’m quite involved in programming. 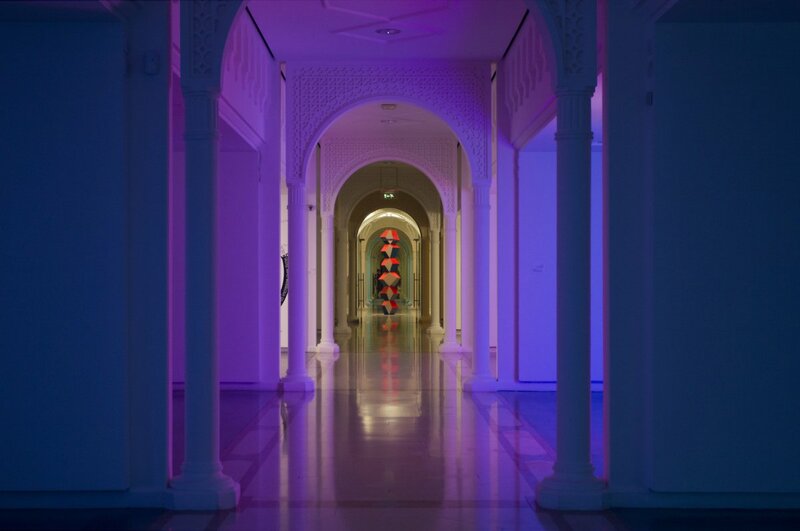 For example, I programmed the lights inside an installation that fits in an architectural situation in different places of a building, so that you could only see one place at a time. I also program lights in motion that follow a musical score, so one feeds into the other. It is not music (in this case), it’s a visual representation of a musical score. TSAO Yidi is a writer, independent curator, producer and translator specialised in new media art. She studied English Language and Literature at Hong Kong Baptist University and received a Master of Arts in Creative Media with Distinction from School of Creative Media of City University of Hong Kong. In 2016, she served as Chair of Artist Residency Programme of ISEA2016, one of the world’s most prominent international arts and technology events. She is also involved with Inter-Act Arts, a Hong Kong-based curatorial collective. Her articles on the contemporary art world can be found on randian, cobosocial, The Art Newspaper China, Leap, etc.